SUMMARY: Gigi, Bea, and Neerja have been best friends since they were little. Now in high school, they worry that their high school years are passing them by. Super-smart but invisible, the girls put together a plan to get noticed. ROMANTIC HEAT: Like a warm spring day. It starts out cool, warms up slowly, and ends beautifully. Romance isn't the main story, but it is definitely there. WHAT I LIKED: Strong girl friendships take center-stage in this cute story about three friends navigating cliques, unfair teachers, budding romances, and high school politics. I especially loved Gigi's character; she stands up for herself and doesn't worry about what everyone else does or thinks. The girls' friendship endures many tests, but the three friends find strength in themselves and each other when times get tough. While they don't always make the best decisions concerning one another, they also sacrifice themselves at times for the sake of their friends. The story has a strong message that while boys may come and go, strong friendships will survive. I also love the theme of not judging people before you know them. Gigi believes that everyone prejudges her as being a smart, geeky girl. By the end of the story, however, she realizes that she is judging others just as much. She stereotypes Sienna as a brainless cheerleader, Mike as a stupid jock, Will as a cute, sensitive California surfer, and Ava as a fickle friend. As she gets to know them better, Gigi learns that there is much more to the people she only barely knows. WHAT I DIDN'T LIKE: Early in the story, I considered abandoning this one. In the beginning, it reads more like a "slice of life" story than one with a defined plot. The girls talk, giggle, go to school. Gigi gets into trouble (totally unfair, that). They hang out at a cemetery. I didn't think I would EVER get into the story, even after about 130 pages. The only reason I really kept reading is that I was mildly interested in how events with Gigi and her love interests would play out. Eventually, I did get into the story and finished the last 100 or so pages in one sitting. If you are reading it right now or are considering reading it soon, know that it does pick up eventually. The romances are predictable, but I enjoyed them anyway (especially all the banter between Gigi and Mike). The slow build-up to that first, sweet kiss is one of my favorite things about reading middle school chick lit. 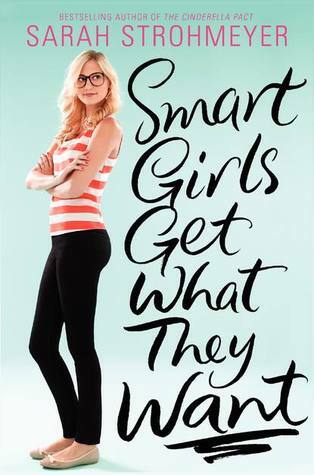 THE BOTTOM LINE: Smart Girls is a 2013-2014 Lone Star Reading List pick, and I think it is a good one. A great choice for middle school girls looking for books about friends, school, and a little bit of romance. STATUS IN MY LIBRARY: We have it. It's a Lone Star for 2013-2014 school year, so I expect it to be pretty popular with my girls next year.